The ancient temple enshrining Subramanyar at Kanchipuram has been revered by the hymns of Arunagirinathar. It is located in between the Kamakshi and Ekambreswarar temples in the Somaskanda formation in the town of Kanchipuram. It is to be noted that there is no separate shrine to Ambal in any of the Shiva temples at Kanchipuram, and that the Somaskanda shrine at the Ekambreswarar temple is of great significance. 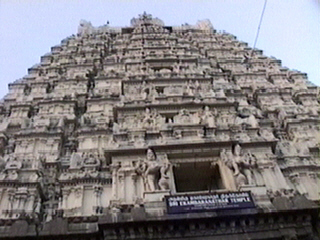 Shown above, is the Rajagopuram of the Ekambreswarar temple at Kanchipuram (Kachi Ekambam). Kumara Kottam is a well visited temple with two prakarams and a complete pantheon of parivara devatas enshrined in their respective shrines. The Kartikai asterism each month attracts large crowds. The priests here are said to come down the lineage of Kachiappa Sivachariyar associated with the Skanda Puranam. Six worship services are carried out each day here. The annual festival is celebrated here in the month of Vaikasi (as with the Varadaraja perumal temple in Chinna Kanchi) and Skanda sashti in the tamil month of Aippasi. The temple town of Kanchipuram has several Saivite and Vaishnavite temples glorified by the Tevaram hymns of the Nayanmars and the Prabandam hymns of the Alwars.